Hotel facing the sea: we are really on the beach! Good morning from the golden swan! The Hotel Cigno d'Oro is a modern three-star hotel in Riccione with direct access to the beach, suitable for both families and those traveling as a couple. It has a large fenced parking, open-air porch, free WI-FI throughout the entire hotel and sea view rooms. 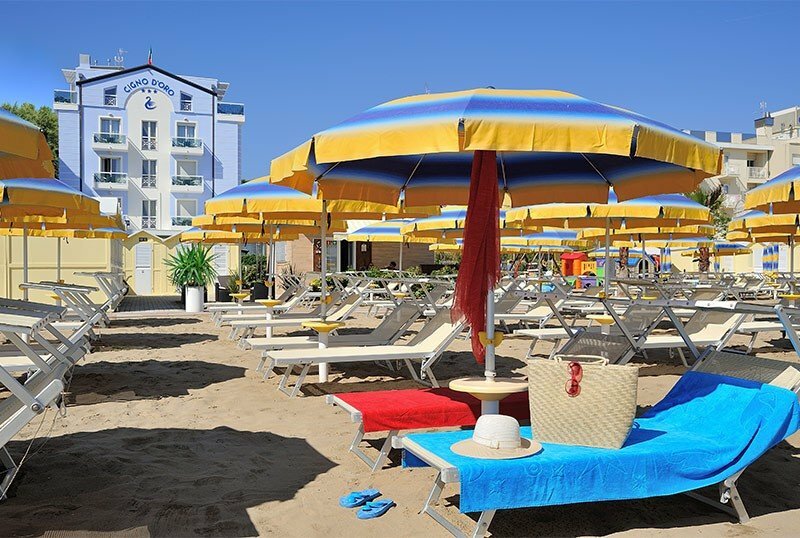 The hotel is in Riccione (Alba area) in front of the beach, to which it has direct access without crossing roads. The canal port is about ten minutes on foot, Viale Ceccarini can be reached by bus line n. 11 in a few minutes or on foot in about 20 minutes. All rooms have a balcony, air conditioning, WI-FI, minibar, electric shutters, LCD TV 22 or 26 ", safe, telephone, beds with orthopedic nets, private bathroom with shower, courtesy set and hairdryer. CLASSIC: modern interior and balcony with side sea view. MARINA: for a splendid awakening with balcony facing the sea. FAMILIES: family rooms are available for numerous families. Garden, terrace, free bicycles with child seats, connecting bar with garden terrace, TV room, reading area (with newspapers, magazines and books), panoramic lift, 24 hour concierge, Sunday aperitif. On request: laundry service, beach towel. PARKING: fenced, uncovered and free, reservable with supplement; reserved parking space in covered garage for a fee. WI-FI: free and available throughout the entire hotel. AIR CONDITIONING: free and available both in the common areas and in the rooms. CONVENTIONS: beach, amusement parks, spas, free admission to the Beach Village water park in Riccione. Possibility of organized excursions. SERVICES FOR DISABLED: accessible entrance, on the ground floor. BREAKFAST: sweet and savory buffet with homemade products (like cakes) and a corner of organic products. LUNCH AND DINNER: local cuisine with 2/3 menu choices based on meat and fish, with a buffet of vegetables, salads, cheeses, side dishes and appetizers. Meals are served in the large and bright sea view restaurant. Pasta and desserts are homemade. VARIATIONS: gluten-free cooking on request, variations for those who follow particular dietary diets (such as diabetes, intolerances, low-calorie diets, pregnancy). In hotel: indoor playground area for children, equipped and colorful, with games and DVDs, strollers, bicycles with child seats. Baby sitter and pediatrician on request. In the room: cribs, bunk beds, cribs with soft sides, night lights, adjustable fall protection rails, toilet reducers, bath stools, baby baths and bottle warmers. At meals: flexible hours, homogenized, baby food, possibility for mothers to agree on tailor-made menus. On the beach: swimming pool, playground area. The hotel has an agreement with the Bagno n. 112 - 113. At guests' disposal: swimming pool, children's playground area, sunbeds, beach umbrella, cabins. Prices are per day per person in full board for a minimum stay of 5 days. - Deposit: The reservation is guaranteed following the payment of a deposit of € 200.00 per person, by bank transfer, postal order or credit card. - Late Arrival / Early Departure: an indemnity equal to the price of the overnight stay up to a maximum of 3 days will be charged. - Meals not consumed will not be deducted, but on request they can be replaced with a travel basket. We awaken spring, waiting for Summer. FREE CHILDREN FAMILY SIZE OFFER! To recharge "the batteries" in a hotel on the beach, enjoy the first rays of sun and a nice swim in the sea ... Here we are! Relaxation awaits you by the sea!